Scientists have long wondered how a simple fertilized egg transforms into a highly differentiated multicellular organism. How do cells know where to migrate? Why do some cells become neurons and others bone? Morphogenesis is the process that determines the spatial distribution of cells during embryonic development that result in the overall body plan. In 1901, the American evolutionary biologist-geneticist Thomas Hunt Morgan observed that regeneration of worms occurs at different positions and at different rates on the worm’s body. Morgan suggested that morphogenesis results from signals that are released from localized groups of cells (“organizing centers”) to cause differentiation of the cells around them. One-half century later, in his paper “The Chemical Basis for Morphogenesis” (1952), Alan Turing proposed that chemicals, which he called morphogens (“form producers”), start from a homogeneous distribution and organize into spatial patterns based on their concentration. “FRENCH FLAG MODEL.” In 1969, Lewis Wolpert, a South African–born British professor of developmental biology at the University College London, envisioned morphogens to be secreted from a group of source cells that travel at different concentrations to serve as signaling mechanisms, acting directly on target cells to produce a response. The intensity of this response is based on the morphogen concentration at the target cell. By way of illustration, he used the “French flag model,” which has three broad vertical strips of blue, white, and red. Cells closest to the source (blue strip) would receive the highest concentration of morphogen, which would activate high-threshold target genes; cells farther from the source (white) would receive lower levels of morphogen activitating low-activity genes; those cells farthest (red) away would not be activated. Different combinations of target cells would be activated based on their distance from the source. During the 1980s, the German biologist Christiane Nüsslein-Volhard, based on the French flag model and morphogens, determined the genetic basis for the head-to-tail body plan of the fruit fly—work for which she was a co-recipient of the 1995 Nobel Prize. SEE ALSO: Regeneration (1744), Genes on Chromosomes (1910), Embryonic Induction (1924), Pattern Formations in Nature (1952). The “French flag model” has been used to illustrate how the relative concentration of morphogen determines the distribution of cells during embryonic development. 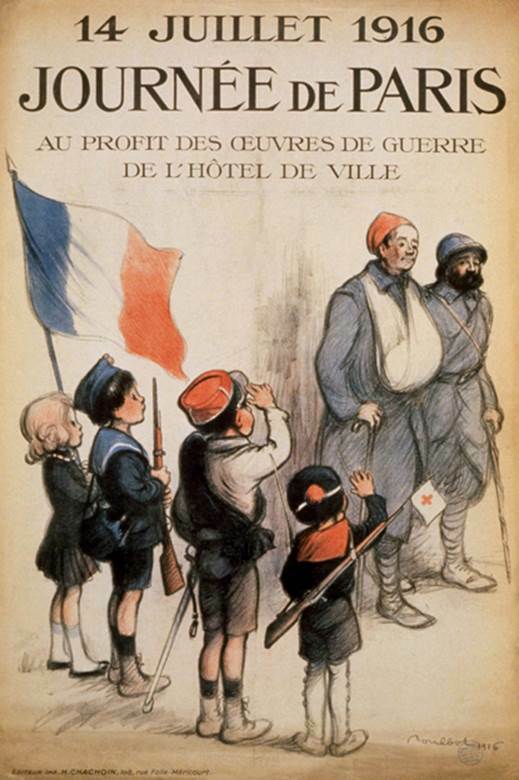 This poster depicts small children bearing toy muskets and the French flag while saluting wounded World War I soldiers on Bastille Day, 1916.